Sun shines at its peak when I get out of work around 4:00 pm. By the time I come home after picking kids from their Summer Camp, I will be exhausted and wish to lay down on the couch and cool down a bit. Soon the reality of preparing dinner awakes my indolent brain and I give up the relaxation mode of my body. At times I put a halt to my instinct to cook and will be completely on a relaxation mode by not moving a single finger. I will be the queen of laziness on those days. I am sure all Moms experience this mode once in a while when she is exhausted to the core. During summer I hate to spend more time in the kitchen on weekdays when the evening sun shines so bright into my kitchen through the window. I don't like to close the window blinds and cook in the artificial light, so to make things easier, quick meals are planned for weekdays. Grilling is the best option for us in summer. 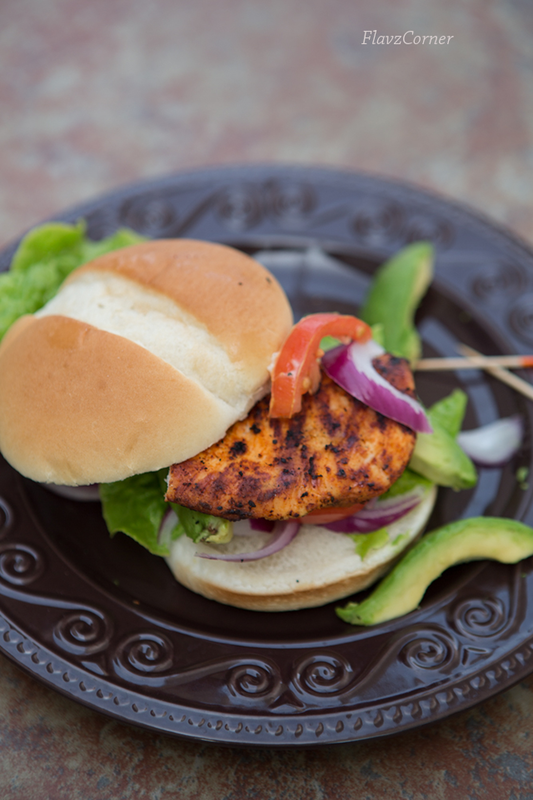 This quick and easy spicy chicken sandwich was created without any planning. I threw in few ingredients from what I had in the pantry and viola it turned out to be a quick and easy filling dinner option. You can see from my pictures that it was not a planned one and I was randomly clicking pictures just in case if it turns out to be a recipe that I can blog about. Obviously it was worth sharing and hence this post originate. 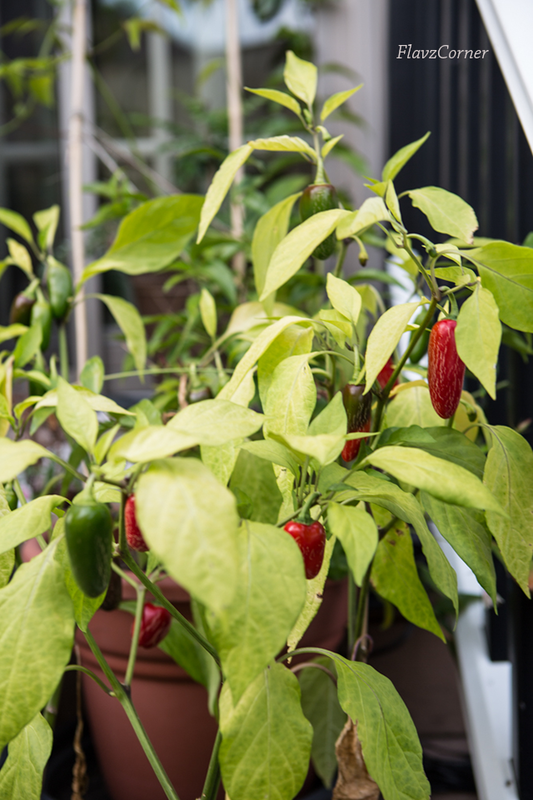 Growing some Jalapenos in my patio.. The spices in this recipe can be adjusted per your taste. You can melt a piece of Swiss cheese on the top of the chicken and add your desired condiments to the sandwich to suit your palate. Wash and pat dry the chicken breast with paper towel. If the chicken breast is thick, slice it thin horizontally or you can pound the chicken breast by placing it between plastic wrap and pound with a kitchen mallet. Mix all the ingredients from the first list except chicken in a bowl. Taste the marinate for salt and adjust per your taste. Now add the chicken breast to the marinade. Mix well. Make sure each piece is marinated good. Keep it in the refrigerator for 15 - 20 minutes. Heat the grill to medium heat. Cut a onion into half and insert a fork into the top of the onion half with flat side in the bottom. Dip the onion in oil and brush the grill with it. This acts like a non stick coat. Place the chicken pieces over the grill, cover and cook for 5 minutes. Flip the side and cook for 5 minutes. Lower the flame to low; cover with the lid and cook till the chicken is fully cooked and center of the chicken is no more pink. Brush some Franks's hot sauce on both side of the chicken and grill for another 5 minutes. 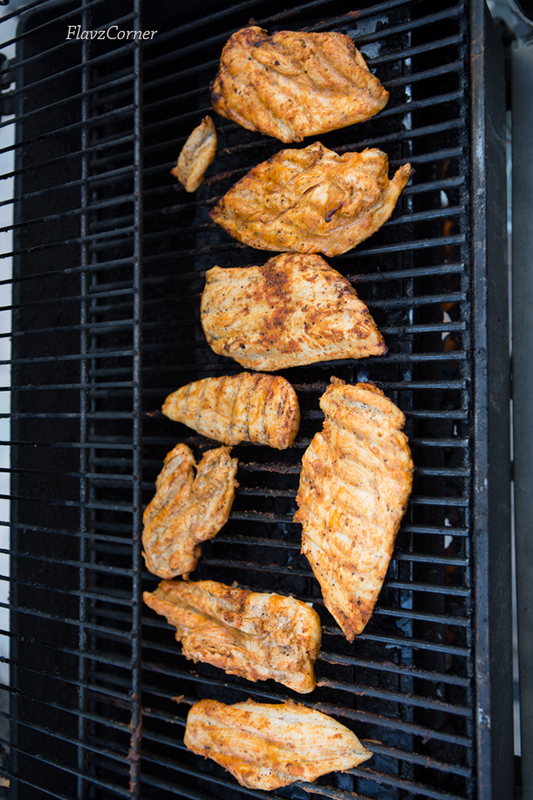 Turn off the grill and transfer the chicken into a plate. Add the lemon juice to the avocado slices, onion rings. Spread some mayonnaise on the buns. Assemble the sandwich with the desired condiments and secure them with a clean toothpick. Serve them hot. A fantastic sandwich, Shibi. So summery and delicious. Gotta try the chicken breast on my grill pan. I'm not a 'spicy girl' but husband love it, this recipe sounds perfect for him. I'm sure he is going to love when I surprise him with this yummy sandwich. 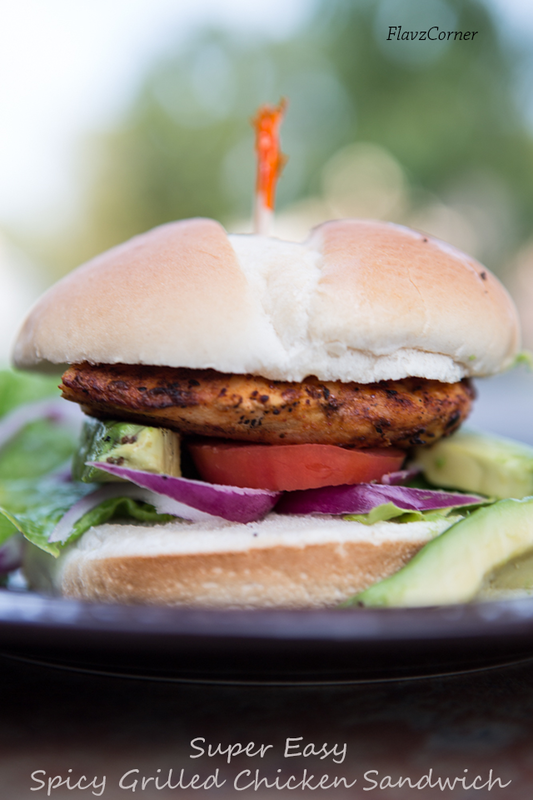 What a delicious looking sandwich, Shibi! Loving the smoky and spicy flavors! YUM! Wow..looks very tempting and filling dinner..yummy ones !! 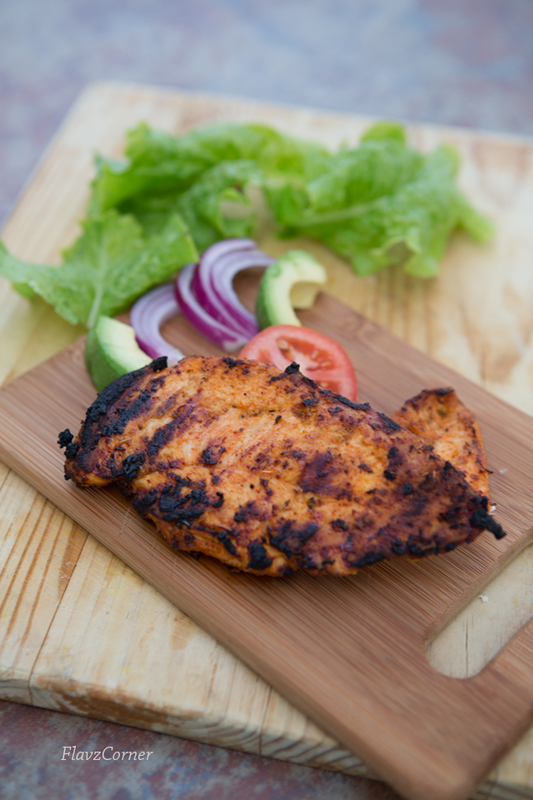 Love grilled chicken! Nice all by itself, superb in a sandwich. That's such a colorful sandwich you put together -- my kind of food. ;-) Thanks so much.